Here Your Heart Will Be is a cute Etsy shop which sells lots of adorable cards such as Ghibli themed ones, Pokemon ones ETC. There is literally so much to choose from and it's all gorgeous! 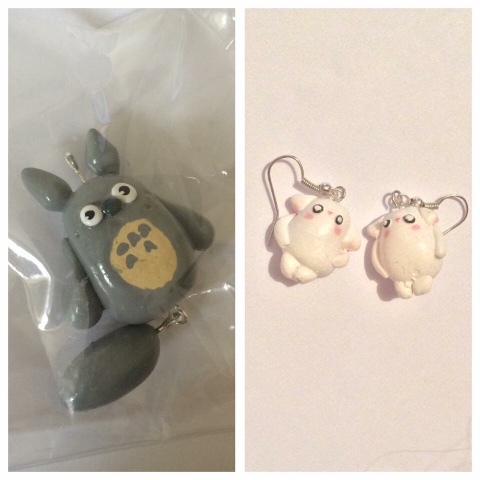 I eventually decided on a couple to review as well as a handmade Totoro charm. Katherine was also sweet enough to include some super cute earrings as well which I wasn't expecting. So here's what the charm and earrings look like! They're handmade out of fimo clay and finished with acrylic paint and varnish. Both items are so sweet, I'm really happy with them! I believe the earrings are a character called Bostwick which I've seen lots of on her shop and the little guy is so cute, I'm in love with him. 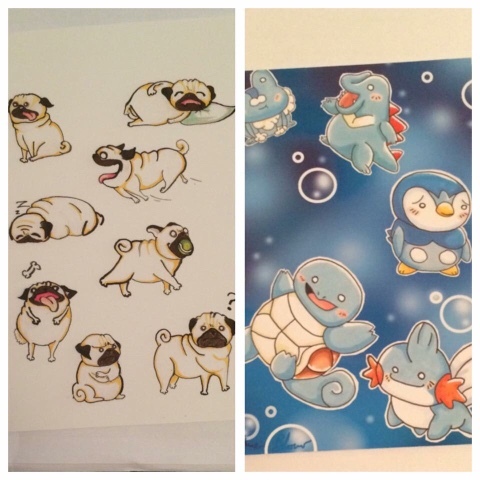 These are the two greetings cards that I chose. I think the designs are so cute I'm obsessed with her artwork style. I'm actually going to go ahead and cut the back off these and frame them up like little prints as they are just too precious not to display them in my home. I chose the pug one because I love pugs and the little poses that they're in are just adorable - I literally could not resist. And y'all know that I have a weakness for Mudkip. I like all water Pokemon really, especially Squirtle so as you can imagine I have serious love for this little card. Again, the art style is super cute and they're drawn in such cute poses. I'm thoroughly pleased with everything that I received from Here Your Heart a Will Be and I thoroughly recommend checking out their vast selection of cute greetings cards. I'm in serious need of some of Katherine's Ghibli ones so I'll most likely be back with another review! Check out her shop here.